Gov. Chris Sununu recognized May as Lyme Disease Awareness Month, but the New Hampshire Dep. of Health and Human Services recommends everyone be vigilant in detecting ticks - like the one shown here from the state website. New Hampshire residents have long known the risks of contracting diseases like Lyme and West Nile from a tick or mosquito bite, but a recent report from the federal Centers for Disease Control and Prevention says there’s even more to worry about. The CDC is now tracking 16 of these “vector-borne diseases” and says the number of cases has tripled between 2004 and 2016. The Exchange looked into the rise in tick and mosquito-borne illness in New England, including what may be causing the increase in these pests and the diseases they carry, and what residents can do to protect themselves. Dr. Elizabeth Talbot, associate professor of medicine at Geisel School of Medicine at Dartmouth College, specializing in infectious disease and international health, says there are more tick-borne diseases than many people may be aware of. Talbot said there are now five major tick-borne diseases being monitored in New Hampshire. This increase in disease is combined with a tick population that is larger than usual. Jonathan Winter, assistant professor of geography at Dartmouth College, has studied the impact of climate change on Northern New England. He says changes in land use contribute to a spike in tick populations. "Everyone has heard about Lyme disease," Talbot said. "But we're also steep on the learning curve for anaplasma, babesia, powassan virus, and there's a new kid on the block: borrelia miyamotoi. Many experts believe that we're probably actually under-diagnosing that." When builders break up the forest with developed residential areas, they limit the bio-diversity in some sections. This ultimately drives up the population of two of the ticks’ favorite hosts: deer and mice. 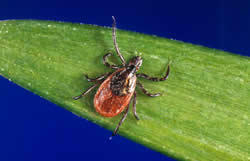 Another major factor, Winter said, is the potential impact of a warming climate, which widens the natural range of ticks. An increase in rainfall may also have an effect. Although the tick population and tick-borne diseases have been on the rise for many years, Winter says it’s still too early to know for certain how this summer will stack up. Whether or not this summer will continue the trend of increased bug-borne illness, Talbot says that New Englanders should be thinking about disease prevention. The prospect of a vaccine to prevent Lyme and other tick-borne diseases has many people excited, but, so far, it’s proven to be a complicated issue. Talbot said that after Lymerix’s release, a theoretical concern was raised that the vaccine might engender an autoimmune disease, and, although it was only theoretical, the uptake fell dramatically. Now, Talbot says any new vaccine must protect the public not only from Lyme, but also the other tick-borne illnesses. “I have not heard that there’s anything particularly imminent to cover all of these diseases we know about, and all of these diseases we don’t know about, that these ticks can transmit,” she said. In the meantime, there are other ways to protect yourself against the threat of tick and mosquito bites. “I truly believe that there are ways that people can effectively prevent these diseases,” Talbot said, noting that many of these practices are under-used. She mentioned DEET, which is effective at repelling bugs when applied to the skin, and the lesser-known permethrin, which can be used to treat fabrics, such as pant-legs, socks, and shoelaces. “It’s routinely available in most hardware stores or Walmart-type stores,” she said, adding that the chemical binds to the fibers of cloth and lasts through many washes. Talbot also suggested wearing light-colored clothing while hiking, walking, or working outside, as this makes it easier to spot ticks before they reach the skin and bite. To learn more about the increase in bug-borne illnesses and what you can do to protect yourself this summer, listen to the full conversation here. Public health officials are urging use of bug repellent this season as cases of tick and mosquito-borne disease are on the rise. The insects have been expanding their range across the U.S., including here in the Northeast, and a new report from the Centers for Disease Control and Prevention shows a significant increase in reported infections. Only in NH: You asked, we answered! Why does New Hampshire still require annual car inspections? NHPR's Casey McDermott went in search of answers. Our very own Jimmy Gutierrez talked to Margaret Gillespie a naturalist at Squam Lake Science Center about Animals with Bad Reputations and then talked to the team about a creature that might deserve its bad rap: the tick. You can visit the Red Barn Speaker Series at the New Hampshire Audubon to hear a talk about some animals who get a bad rap, and why you might want to give them a second chance. Keb' Mo stops by WMOT Roots Radio to discuss how he lives life and how he loves music, including his new TajMo collaboration with Taj Mahal. Listen again at PRX.org. Climate change, which causes rising temperatures, increasingly severe weather events, and shrinking habitats, negatively impacts the moose and loon populations of New Hampshire more than any other factors -- including human interference from road construction or hunting and fishing practices. That's according to longtime wildlife observers, who joined The Exchange to deliver an update on these two beloved new Hampshire species.